Dienstrock M34 for Generals of Waffen SS, made with feldgrau gabardine fabric and five front buttons. Collar tabs, shoulder boards and arm eagle included. Shirt and Tie not included. By buying this product you can collect up to 181 loyalty points. Your cart will total 181 loyalty points that can be converted into a voucher of 3,62 €. 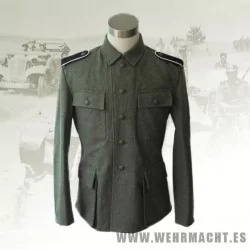 Replica of the Officers Stiefelhose for Wehrmacht and Waffen SS, Stone Gray gabardine version. General's Schirmmutze made in Germany by EREL who made this same cap in WW2. Feldgrau tricot top, black velvet band, silver piping, silver wire chin strap, pebbled buttons on the chinstrap, black Vulkanfibre peak visor, metal stiffener in the top of the inside of the cap to keep its flat top shape, metal eagle and skull cap badges. SS Officers leather belt with buckle made in zinc. Buckle have manufacturer markings. Dienstrock for Generals of the Waffen SS, made with feldgrau gabardine fabric, the collar is open with silver piping, two pockets with central reinforcement and two hidden pockets, four front buttons, French cuffs, the lining completely covers inside the jacket. Before select you rank, see "Ranks of Waffen SS".